We hereby notify you that the company extracts will be adapted as of the 9th of April 2019. How to verify if the extract is a valid document? 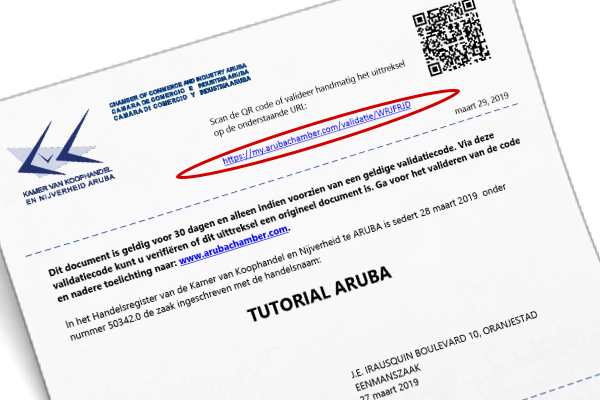 https://my.arubachamber.com/validatie and insert the code, to verify its validation. The QR code can also be scanned through a mobile phone camera. This code is valid for 30 days. After this period has elapsed a new extract should be purchased. For any questions, more information or personal support please contact us at: businessinfo@arubachamber.com or telephone: 582-1566, ext. 27/30/35/42.